The Skeleton Dance is a 1929 Silly Symphony animated short subject produced and directed by Walt Disney and animated by Ub Iwerks. In the film, four human skeletons dance and make music around a spooky graveyard—a modern film example of medieval European "danse macabre" imagery. It is the first entry in the Silly Symphony series. The origins for The Skeleton Dance can be traced to mid-1928, when Walt Disney was on his way to New York to arrange a distribution deal for his new Mickey Mouse cartoons and to record the soundtrack for his first sound cartoon, Steamboat Willie. During a stopover in Kansas City, Disney paid a visit to his old acquaintance Carl Stalling, then an organist at the Isis Theatre, to compose scores for his first two Mickey shorts, Plane Crazy and The Gallopin' Gaucho. While there, Stalling proposed to Disney a series of "musical novelty" cartoons combining music and animation, which would become the genesis for the Silly Symphony series, and pitched an idea about skeletons dancing in a graveyard. Stalling would eventually join Disney's studio as staff composer. Animation on The Skeleton Dance began in January 1929, with Ub Iwerks animating the majority of the film in almost six weeks. The soundtrack was recorded at Pat Powers' Cinephone studio in New York in February 1929, along with that of the Mickey Mouse short The Opry House. The final negative cost $5,485.40. 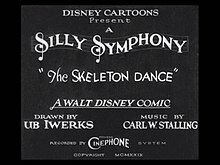 In order to attract a national distributor for the Silly Symphony series, Walt and Roy Disney arranged for The Skeleton Dance to run at the Carthay Circle Theatre in Los Angeles and at the Fox Theatre in San Francisco in June 1929, while Pat Powers arranged for it to play at New York's Roxy Theatre from July. In early August, Columbia Pictures agreed to distribute the Silly Symphonies, and The Skeleton Dance played as a Columbia release in September at the Roxy, making it the first picture in the theater's history have a return engagement. In February 1931, The New York Times reported that the film had been banned in Denmark for being "too macabre". ^ Walt Disney Animation Studios (15 October 2015). "Silly Symphonies - The Skeleton Dance" – via YouTube. ^ a b Merritt, Russell; Kaufman, J. B. (2006). Walt Disney's Silly Symphonies: A Companion to the Classic Cartoon Series (2nd ed.). Disney Editions. Markstein, Donald D. "The Skeleton Dance". Toonopedia.